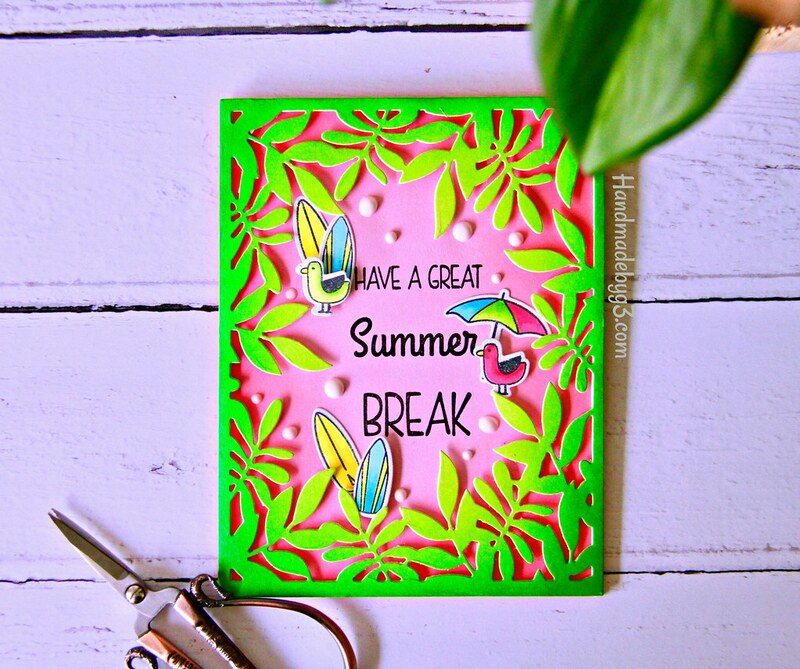 I have another Simon Says Stamp card using the Friendly Frolic release products to share with your today. When you see this post, I am on a flight to India. A week in my home town to attend my Dad’s first anniversary and also bringing my mother with me to Australia. Cannot believe it has already been a year since my dad passed away. My mum will be staying with me for a few months. So looking forward to having her after very very long time. I will be learning lots of traditional south Indian recipes. Cannot wait 🙂 Anyway, next week all my posts are scheduled posts. I will be back to my routine from week after. 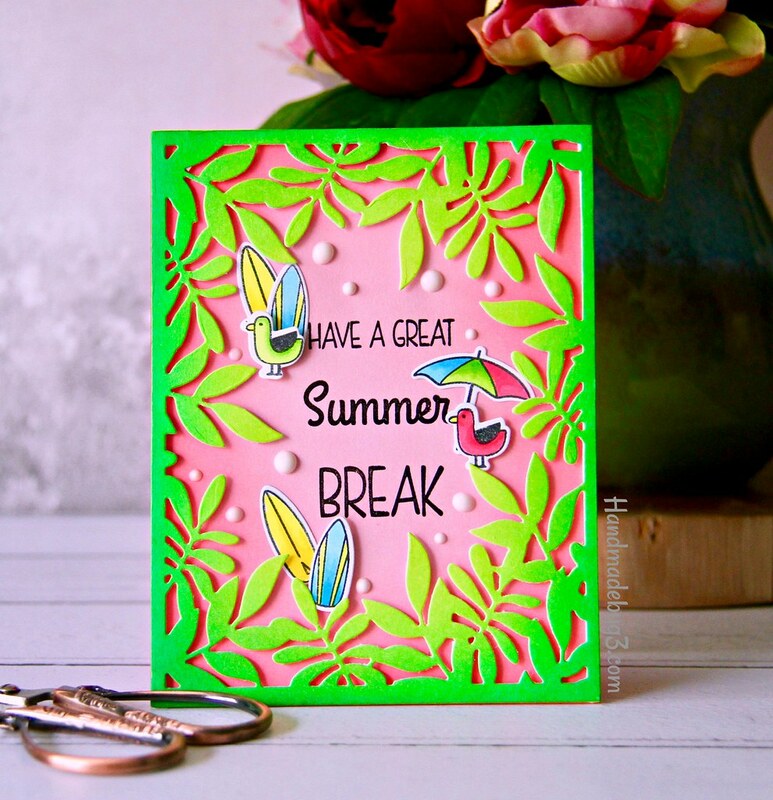 Coming back to today’s card, I cannot get enough of the Leafy Frame die release recently. One of my favourite in the release. 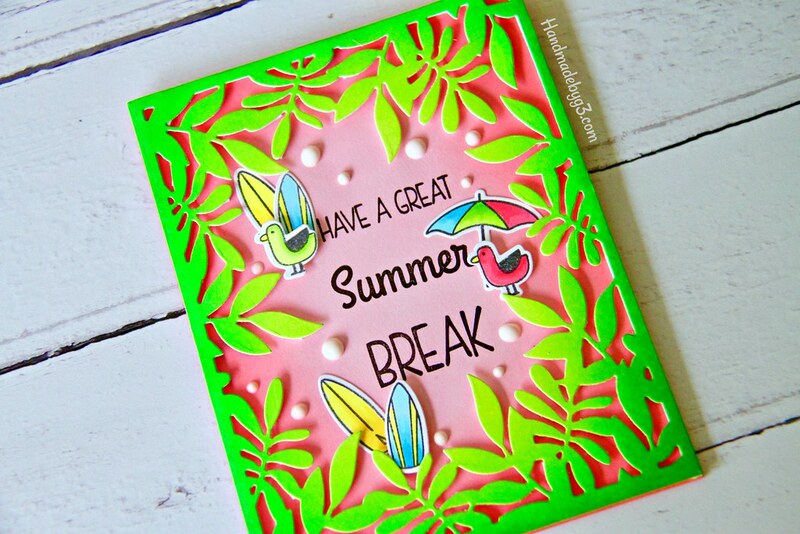 I made another summer card using this die combining with some of the older Simon Says Stamp stamp sets and dies. But first here is the card. I started with sponging two white panels. I trimmed two Neenah Solar White 80lbs panels. On one panel, I sponged Spun Sugar and Worn Liptstick distress inks and on the other I sponged Twisted Citron and Mowed Lawn distress inks. I first sponged the lighter shade of both the colours on each of the panel first, then came in with the darker shade of each of the colour on the edges of the panels. I did take the darker shade a bit towards the centre not too much. There was a lot of elbow grease to get the blending smooth and even. I love the green and pink colours together. They make such beautiful combination. For summer, they are a great colours. The current colour trend takes this combination to another level by muting the colours. It is dusty or blush pink with sage green. I really want to try the combination in one of my future card. The sentiment is from School Bus Messages stamp set. I simply stamped the sentiment in Versafine Onyx Black ink on the pink sponged panel right in the centre. 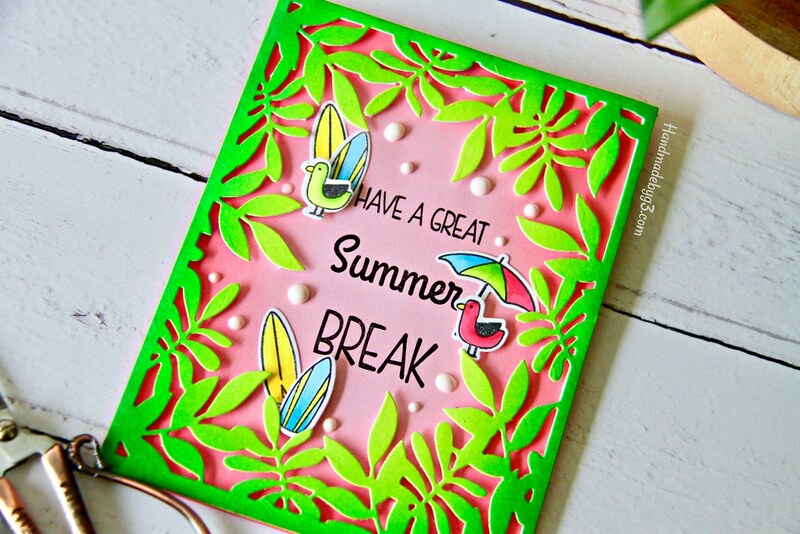 I then die cut the green sponged panel using the Leafy Frame die and added foam adhesive on the back of the die cut and adhered on top of the pink sponged panel. Then I stamped, coloured and die cut the smaller images from Simon’s Surf’s Up stamp set from Good Vibes collection. I clustered them and adhered in three spots. One or two of the elements in the cluster is glued down and other element is adhered using foam adhesive. Finally I added a few Nuvo white crystal drops to fill in some empty spaces. 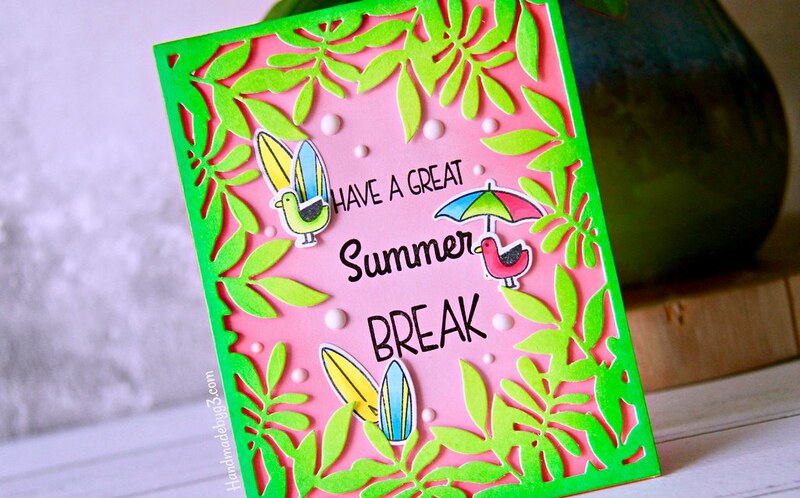 I love how bright and summery this card turned out. One of my favourites I think. I have listed all my supplies used to make this card is listed below. Have a wonderful weekend! I will see you back here on Monday!